Blanket Jackson. I never understood why Michael Jackson would name his son, Blanket. Celebrities, in general, never choose ‘normal’ names like Mary or John. Gweneth Paltrow chose Apple for her daughter; yes, like the fruit. And, Penn Jillette of Penn and Teller chose the name Moxie Crimefighter. Nothing says, ‘It’s a girl!’ like Moxie Crimefighter. But, Blanket—that one’s making a bit more sense to me this winter. We just experienced a polar vortex, where boiled water thrown from a pan outside freezes in mid-air; no wonder a fuzzy blanket readily becomes your favorite accessory. 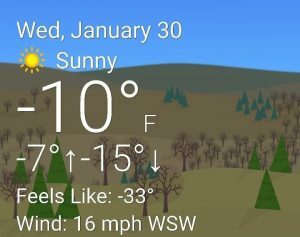 With temps and wind chills, both in the negative double digits, our thermostats had a hard time keeping up…no matter where they were set. We were on a strict 68-degree limit growing up, to keep the heating bills low. Recently, we were lucky if the indoor temp stayed at 68 degrees. So, blankets were essential. I used to have a favorite blanket. It was a muted green with the softest fleece on one side. Some friends got it for me for my birthday one year—from Comforts of Home when it was still in downtown Marion. I loved that blanket. Well, technically, I still love it—although I no longer have it. My youngest son, Dalton, also loved that blanket and would steal it from me any time he got the chance. I’d often find it in his bedroom or downstairs where he played video games. I’ve even seen pictures of him with it as he rode the travel bus to tennis tournaments in high school. He’s a blanket high-jacker—even though he’s always claimed the blanket as his own. It was at one of his lowest points in Afghanistan last year when I knew just what would cheer him up. I grabbed an empty copy paper box from the office, stuffed the now Army green blanket inside, and shipped it halfway across the world. With the 9 ½ hour time difference, there was hardly ever a time when we Facetimed that he wasn’t cuddled up in that blanket. 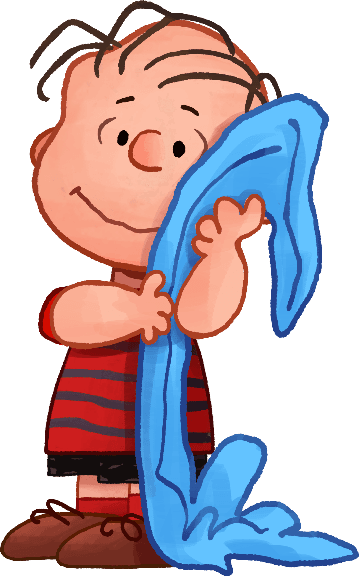 Blankets became a symbol of security well before Linus in Peanuts. 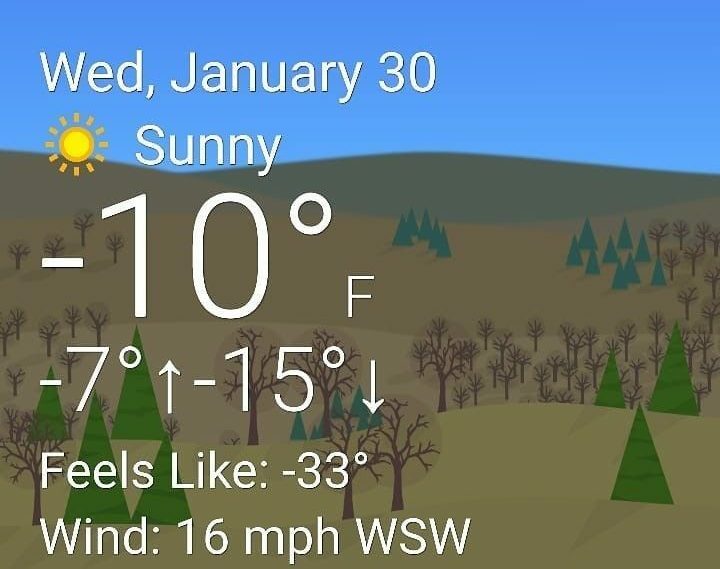 I thought about this last week as Grant County was holed up inside our homes awaiting our temperatures to return to the positives once again. I grabbed up all the great room blankets—there are several even though there are only two of us and a dog living in our home. So, I grabbed them all and threw them in the washing machine with some of those amazing Downy Unstopables…they make everything smell amazing. As I pulled them out of the hot dryer, I grabbed one and quickly wrapped it around my husband. You see, he used to do this for our boys all the time. He’d put their blankets and their bath towels in the dryer for a couple of spins and then surprise them with the security of a nice, hot blanket while watching Scooby Doo or a warm towel when they were just out of the bathtub. 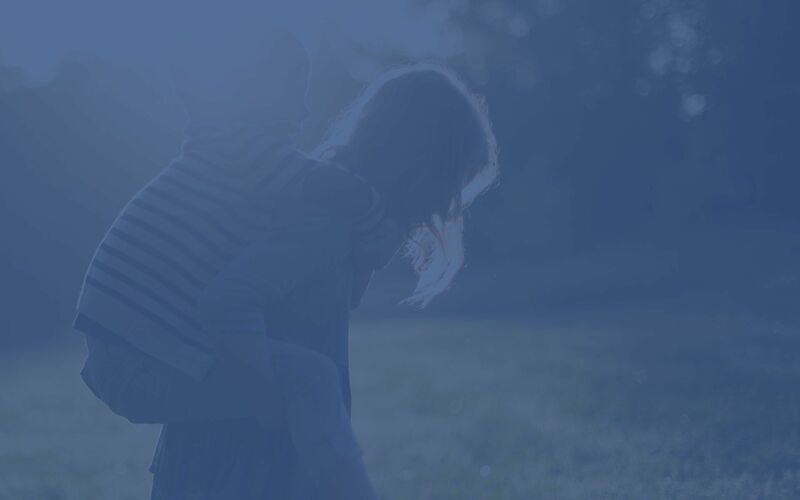 It brought back happy, warm memories of raising our kids. And, then I went about folding the other six, yes six, blankets that we keep in the great room…because they spark joy. And, now we know why Michael Jackson chose the name Blanket—his son sparked joy. I’m sure the use of the term ‘spark joy’ was not lost on many of you. 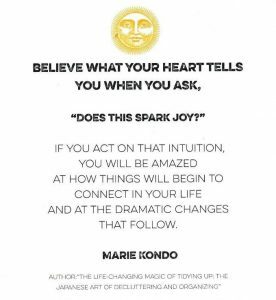 No fewer than half a dozen different people of varied ages have mentioned Marie Konda to me in the past week—she wrote The Life-Changing Magic of Tidying Up and has a Netflix show called Tidying up with Marie Kondo. This 4’7” Japanese organization guru teaches people how to simplify their lives by literally thanking and saying goodbye to the items they own that don’t spark joy. I think she’s on to something! She believes, and probably rightly so, that people are oppressed by too much stuff. So, when Griffin, my senior in college, texted the other day about how much he loved Marie Kondo, I was both happy and downright surprised. Where was Marie Kondo when he was in high school!? 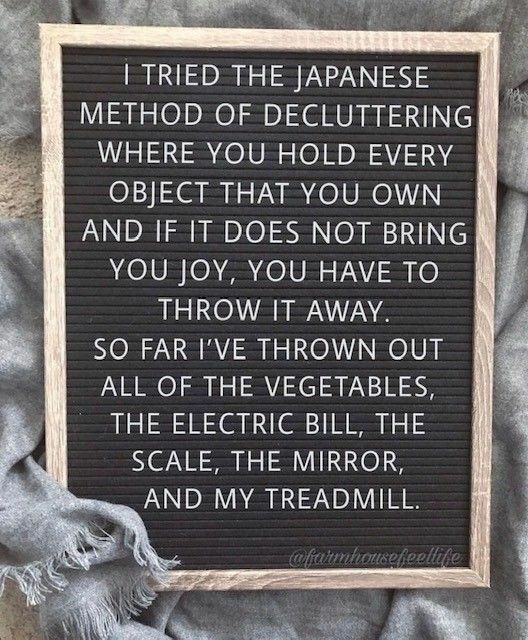 Anyway, as the conversation got a bit deeper, I reminded him that the Kondo Method doesn’t have to apply only to the things that you own. It can also apply to the people you surround yourself with daily. On one of our polar vortex professional development days, I listened to several different Ted Talks to learn valuable leadership lessons from some of the very best. One of them said that your ‘leadership score’ is the average score (1-10) of you and the five people you spend the most time with. Essentially saying, the people with whom you invest the most time will significantly impact the type of person that you are, the person that you are becoming. This is why I absolutely love the KonMari method of saying ‘thank you’ as a way to express gratitude to your belongings for taking care of you while they were in your life. 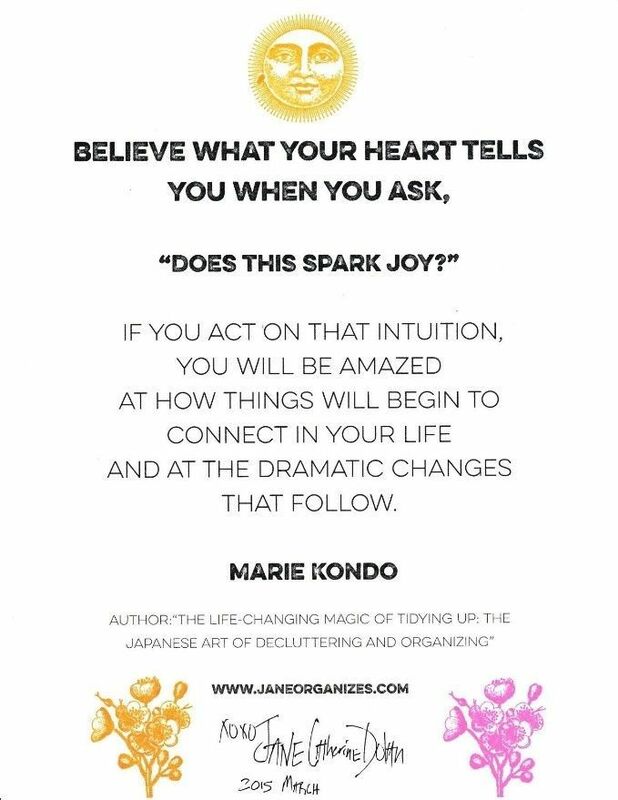 Kondo says this is a way ending the relationship with a sense of positivity. 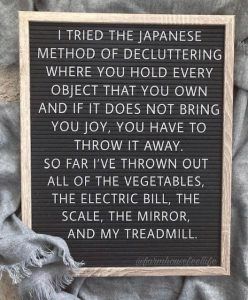 Perhaps this same exercise needs to be done to eliminate the negative ‘people clutter’ in your life. It might be time to thank them for the time they were in your life, so you can positively and proactively move on. There’s an organizational saying out there that says, “Look at all of the things in your house—that used to be money”. I wonder how generous people would be if money weren’t spent on so many useless things. The corollary could also be true, “Look at all of the people in your life, that used to be time“. Was it time well spent? Did they help you accomplish goals? Or change your community? Did they make you a happier, better person? There’s something about investing your time and money wisely that brings about a sense of security. Like the seven blankets in my great room, it sparks joy. What would happen if we all started surrounding ourselves with people and things which sparked joy in our lives? As Robert Fulghum said in Mermaids, “Answer that question and you can build a school, a nation, or a world on it.” A world filled with warm, fluffy blankets.